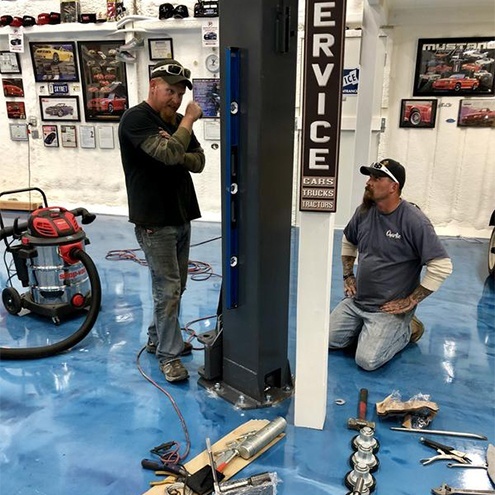 When installing a two-post lift, what is more important, having plumb columns or frame contact pads that are level with one another? 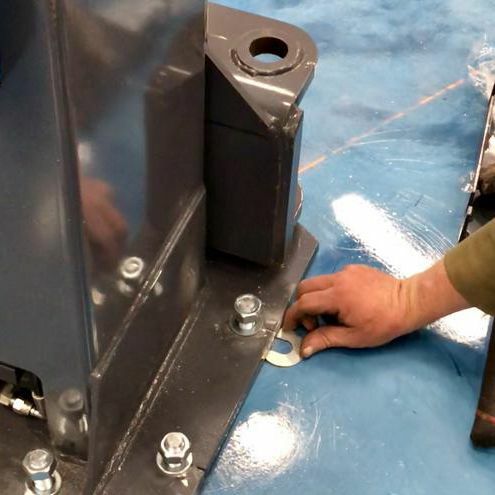 BendPak recommends installing the columns of a two-post lift in a manner that will result in the frame contact pads being level with one another. If the floor is perfectly level, then by all means, pay attention to the column plumbness. But again, always confirm that the frame contact pads are equal. What if there is a slight pitch in the floor? Most garage floors will be sloped at least to a slight degree. If you plumb your columns to a sloped floor, your pads are going to be unlevel. This is very unsafe. More important than plumbness, the columns need to be parallel and the pads should be as close to level with one another as they can be. Let’s assume a subject floor has a one-inch slope right to left with the high side being on the right column. (These instructions are not related to floors sloping forward to back, but rather lateral slopes that can dramatically affect pad height due to the lateral outreach of the lift arms). 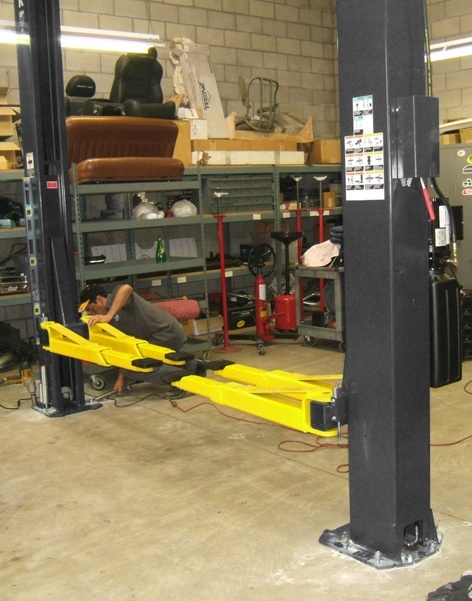 Let’s assume for installation purposes that the overall width on a two-post lift is 145” at the outside of base plates. That would be less than 1/8” of slope every foot. This floor could easily be perceived as a level floor. Install the lift on the sloped floor and shim only as necessary to plumb the columns. In this case, your lift pads would be one inch off – right to left. Depending where your arms are positioned on the vehicle and the distance between pads, that one-inch could translate to dramatically sloped loading and a very dangerous condition. Install the high-side (right) column on the floor surface, and then elevate the low-side (left) column an additional one inch with steel shim plates. Plumb both as required. In this case, even though the floor is sloped one inch, the columns would be installed plumb and the lift pads would be equal. This may be considered a correct installation method; however, there is now 25% less embedment on the anchor bolts, assuming longer ones were not purchased. This may result in different pad heights and make the frame contact pads too high to fit under low-riding cars. Unevenness causes the lift pads on one side of the vehicle to make contact with the frame before the other side, making non-level lifting a real danger. Always shim the columns until you get the pads level with one another. Don’t be too critical that they are not perfectly plumb as long as they are PARALLEL. To double check that they are parallel, lower the lift to the floor, spread the front arms to full extension so that they are pointing directly at each other. Take a measurement from the center of the left front pad to the center of the right front pad. Raise the lift to full height and check to make sure the pad-to-pad measurement is the same with the lift at full height. If the columns are parallel, the measurement should not change. If you find that the columns are not parallel, readjust as necessary. This is not recommended for floors that have considerable pitch and/or require more than one-half inch of shims. Let’s assume that a two-post lift was installed using a level, and that both columns were confirmed to be perfectly plumb. Shortly thereafter, it was discovered that the two left pads were one inch (25.4 mm) higher than the two right pads. What about additional stress imposed on the lift structure when the lift is installed out of plumb? Engineering for a worst-case scenario would be as follows. Assume a 12,000-lb. capacity two-post lift has been shimmed 1/2” on just one edge of the base plate only. This would result in at least 2” of vertical movement or adjustment of the frame contact pads. (That’s why in most cases, shims no thicker than 3/16” are all that is ever required to compensate for pad height adjustment.) The 1/2” shim would result in the base plate being angled about 1.35-degrees, based on dimensions of a typically sized base plate. The column will also be angled 1.35 degrees with respect to vertical. 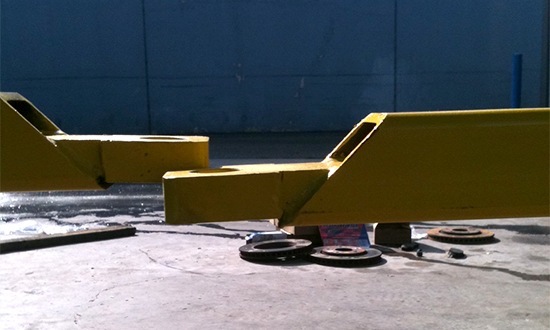 Due to the slight angle of the column, and the lifting carriage raising 70”, the arms will move horizontally 1.78" from their original starting position. Assume the lift has an arm that measures 45.1” to the center of the lift pad from the main column centerline when loaded. Due to 1.78" horizontal shift at full height, the moment arm would increase from 45.1” to 46.9”, or an increase of 4.0%. Therefore, the moment applied to the column and transmitted to the base plate will increase 4%. 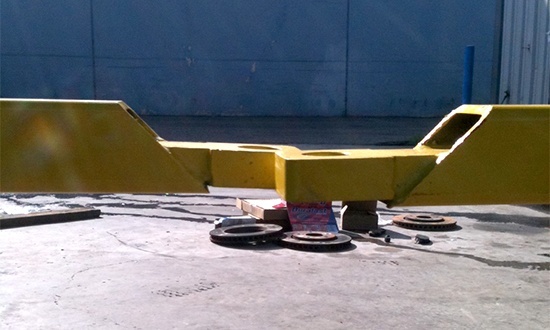 A 4% additional moment load would increase the anchor bolt tension load from 2,772 lbs. to 2,882 lbs. (A single Wej-It 3/4” anchor bolt embedded 5” deep in 3,000 psi concrete has a rated tension capacity of 12,000 lbs. or more.) Considering the fact that our columns and other main structure components have safety factors exceeding 400%, they would be virtually unaffected by a 4% increase in moment loading.